The Days of Johann, an agility dog! : Dog agility injury survey! If you are on Susan Garrett's email list you probably received this email this morning. Susan has a friend that is doing her PhD studying injuries in agility dogs, and she needs our help. If you want to read more about the study or find out more about Kim, check out Susan's blog today. Just a note: Kim is a top competitor in agility, as a Canadian Nationals Champion with her BC, Recess, and as an alternate on the Canadian IFCS World Team. Being an agility dog that has received a couple of injuries in agility during my short three year agility career, the data and information that can potentially be gleaned from this type of survey is very important to me. And sensing from the Google and Yahoo searches I get on dog agility related injuries nearly everyday, I believe it will have significance to many of my readers as well. So we encourage you to participate if you enjoy the love of agility. We took the survey this morning, and it only took a few minutes for both me and Gracie. 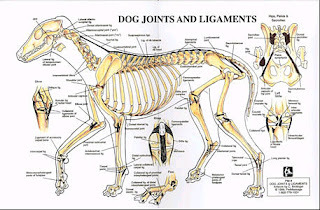 BTW - the dog joints and ligaments image in this post is available as a chart from Dogwise.